Well, guess what?? I am going to share them all with my readers this week during my Green Smoothie Week on the blog! 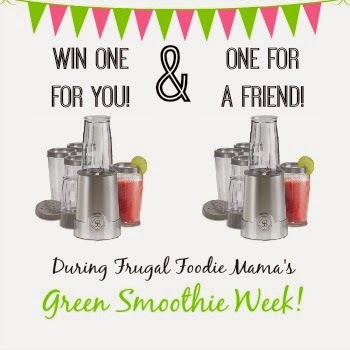 And not only will I be sharing FIVE new green smoothie recipes with you, but myself and a few of my blogger friends are giving you all the chance to win two of my favorite blender for smoothies- one for you and one to give to a friend! :) I really do love this blender! The blender cups are the perfect smoothie portion so you can just unscrew the cap off, pop a straw in, and enjoy. And it is a powerful blender- no worries about little pieces of spinach or kale showing up in your green smoothies. For those of you who may not have heard of a green smoothie before, they are basically healthy fruit smoothies with a leafy green such as spinach or kale thrown in. They really are the perfectly tasty way to sneak more leafy greens into your diet or maybe the kiddos'... or in my case, the husband's. 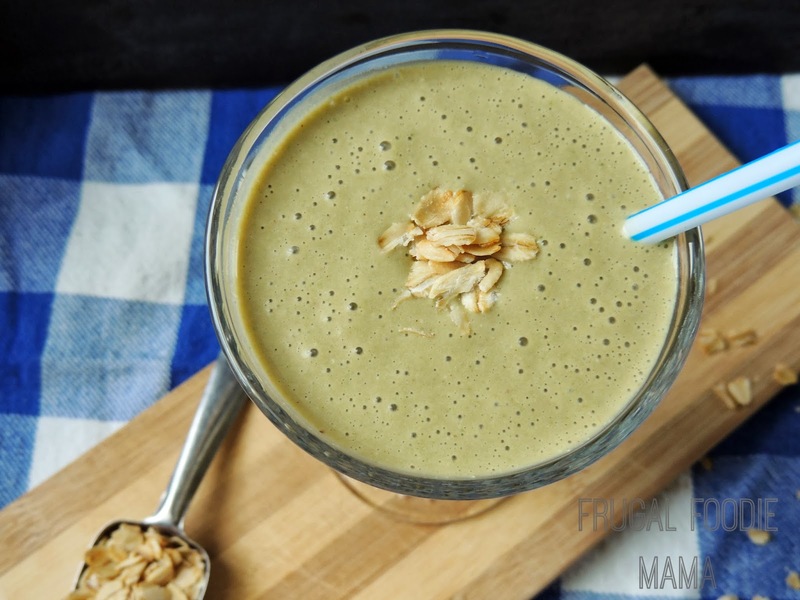 ;) If you want a little bit more of detailed description of a green smoothie, you can visit my recipe post for the Afternoon Pick-Me-Up Green Smoothie. I figured after all of the chocolate, red velvet, and decadent desserts from Valentine's Day, we would all be ready to jump back on the healthy eating wagon- I know that I sure am! Cut each banana in half and then peel. Wrap each banana half in foil and store in the freezer. You will need one frozen banana half for each smoothie you make. I usually just purchase a bunch of bananas each week, and prep at least half of them for my smoothies for the week. You will need 1 cup of rolled oats and 1 tbsp of coconut oil. Preheat your oven to 300 degrees. Line a baking sheet with a silicone mat or parchment paper. In a small bowl, mix together the oats and coconut oil until the oats are well coated. Spread the oats/coconut oil mixture evenly over the prepared baking sheet. Bake for 10-12 minutes, stirring halfway through. Allow the toasted oats to cool completely, and then transfer to an airtight container to have on hand for lots of smoothies! *This giveaway is open to U.S. residents only. All entries for the winner will be checked and verified, so please make sure you are doing what you are claiming in the Rafflecopter or all your entries will be voided. No funny business, folks. ;). By entering you give the right to use your name and likeness. Number of entries received determines the odds of winning. One winner will be selected. The winner will be notified via the email they provide, and will have 48 hours to reply to the email. If the winner does not reply back within the 48 hours, they forfeit the prize and a new winner will be chosen via Rafflecopter. This is a giveaway sponsored as a group buy, which means the bloggers pooled their money together to purchase this product for you. The prize will be ordered from Amazon by Carrie of Frugal Foodie Mama. You will receive the prize shipped directly from Amazon. In the event that the above pictured item is no longer available from Amazon, a product of equal value and quality will be ordered instead. Entries must come from your MAIN social media accounts, not accounts that have been set up separately just for entering giveaways. Entries from these types of accounts will be disqualified. Protected tweets do not count as an entry method for tweeting. Tweets must come from a public account. Bloggers in this group giveaway and their immediate family members in their household cannot enter or win the giveaway. No purchase necessary. Void where prohibited by law.